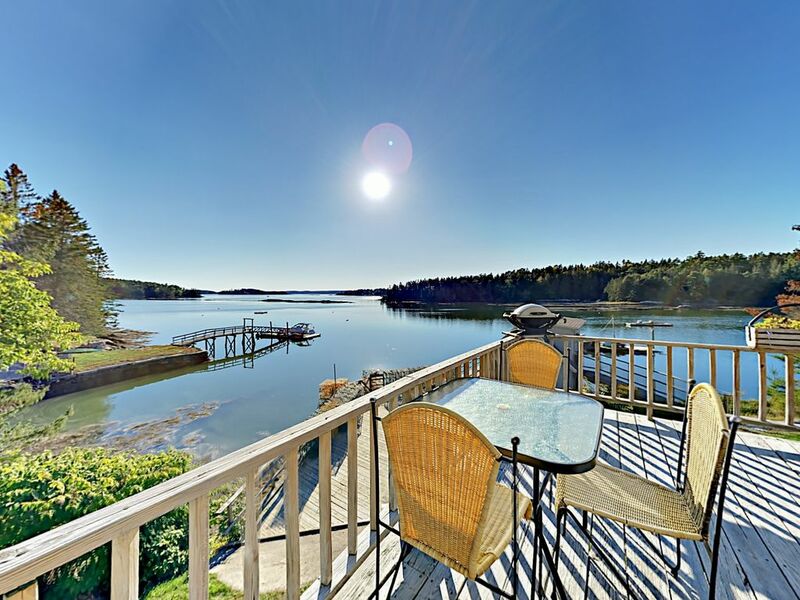 Savor gorgeous views of Boothbay Harbor from your 1BR/1.5BA waterside retreat. Custom woodwork and a charming post-and-beam structure give this home its unique character. You’ll feel like a true local as you spend mornings sipping coffee down by the dock and watching lobstermen hauling traps. Kayak and paddleboard in the waterway just outside your door, or take advantage of nearby hiking and biking trails. Visit the botanical gardens, then head to Robinson’s Wharf for a classic lobster dinner. The spacious living room features beautiful post-and-beam architecture that brings the Maine experience to life. Cuddle up on the cozy love seat or gather with friends on the sofa. Build a fire in the wood-burning fireplace and catch your favorite shows on the 36” wall-mounted TV. Cook romantic meals for two or family dinners in the fully equipped kitchen. Dine at the table for four, or bring your meals out to the deck with bistro table and water views. On the second floor, the spacious loft bedroom is furnished with a queen bed and built-in bookshelves with plenty of space for storage. The en-suite half bath has a unique vessel sink with copper countertop and an adjacent water closet. A full bath on the first floor features a tub/shower combination. Step out onto the wraparound deck and relax with ocean breezes and water views. Soak in the jetted tub with a glass of wine, or unwind on the outdoor love seat with a good book. A set of stairs leads from the deck down to the boathouse and dock. Two guests can enjoy the privacy of the freestanding bunkhouse, right on the water. A bedroom with two twin beds and bookshelves looks out on the full expanse of the harbor. Head down the dock and grab a kayak—available for guests—to experience the beauty of the harbor first hand. Amenities include a washer/dryer, complimentary Wi-Fi, and driveway parking for two cars. The charms of Boothbay Harbor are right at your fingertips with a stay at this waterfront home. The Coastal Maine Botanical Gardens, a hidden gem, is just a 5-minute drive from your door. Maritime enthusiasts can visit the Maine State Aquarium, 2.5 miles away. After a day of sightseeing, kayaking, or paddleboarding on the harbor, stop by Robinson’s Wharf for a taste of local fare. The property was ideally located for a quiet getaway and perfect for a couple. The setting is sheltered but has an excellent view toward the islands and Sheepscot River. We kayaked from the property, and while water access was a little tricky the paddling options were numerous and enjoyable. Boothbay and Boothbay Harbor are each about 10 minutes drive from the property and provide plenty of shopping and dining opportunities. Pinkham Gourmet Foods is worth a visit for their prepared foods, fresh seafood and meats, and wine and beer selections. Do keep the screen door closed, the red squirrels like to check to see if it is open. Be sure to check the Boothbay Region Land Trust () site for lots of local hiking spots. The house looks cute on the outside and has a nice master "suite" but those are the only compliments we have. The house smelled like someone spayed every soft surface, including couch and chair cushions, with artificial potpourri. We opened windows and left for four hours and it was still there when we returned. My husband is very sensitive to chemicals and with a headache, irritated eyes and sinuses, he was unable to stay there. I myself thought it highly unpleasant. The listing says it comes with a separate bunkhouse but it was locked and there was no key (no welcome packet or house info either). We had to call TurnKey who then located the owner and hours later gave us a code for a lockbox to get in. By then, my husband had gone to a hotel. There were no sheets on the bunkhouse beds and it obviously wasn't intended to be part of the rental. We checked out the next day and had to find a last-minute substitute for the week. We immediately notified TurnKey of our departure and asked if we could be at least partially reimbursed given the circumstances. They returned $200 because the bunkhouse wasn't ready but refused any additional compensation. We were out $1,700. The house is also located above a working lobster dock (the bunkhouse is literally on top) - something not mentioned in the listing. Fishermen park their truck next to the house and come and go from their boat, moored at the dock. The house has kayaks but no life jackets and the stairway down to the dock from the deck is an accident waiting to happen with a foot-wide gap on the left side all the way down just as you turn the corner. The kitchen is minimally stocked and clearly not intended for people who eat in. We did find one bowl, a mug and the only two spoons so we could have breakfast cereal on the porch. Fortunately we had great rentals before and after this one so all was not lost, but our experience with this house made our trip to BoothBay the most expensive and unpleasant trip we've ever taken. Our stay was very nice and relaxing. The location was just far enough from town to get peace and privacy while still being a quick drive to many great places. The working fireplace was a major bonus to come home to every evening. Being right on the ocean and seeing the fishermen work was an incredible experience. Only complaints are the less then comfortable and rickety couches and the lack of a note saying the microwave did not work properly. Had it running for two minutes and came back inside to an unbearable chemical burn smell filling the house and rendering our delicious leftovers inedible. In comparison to the rest of our experience it was a rather minor complaint. P.s. Pack towels if you have the space. There was only one bath towel for the two of us and later we found some very rough beach towels. Lovely time, perfect for a couples retreat. The house and location were great, working with turnkey instead of the owner of the property (rented through Airbnb) was challenging because I could not find anyone who actually knew the home. They said they had cable, but it was not working, they said WiFi, but no one could actually connect. Any coffee filters? No one knows! Delightful cottage by the water, comfortable, beautiful sunrise/sunsets. Perfect for a family Thanksgiving celebration.